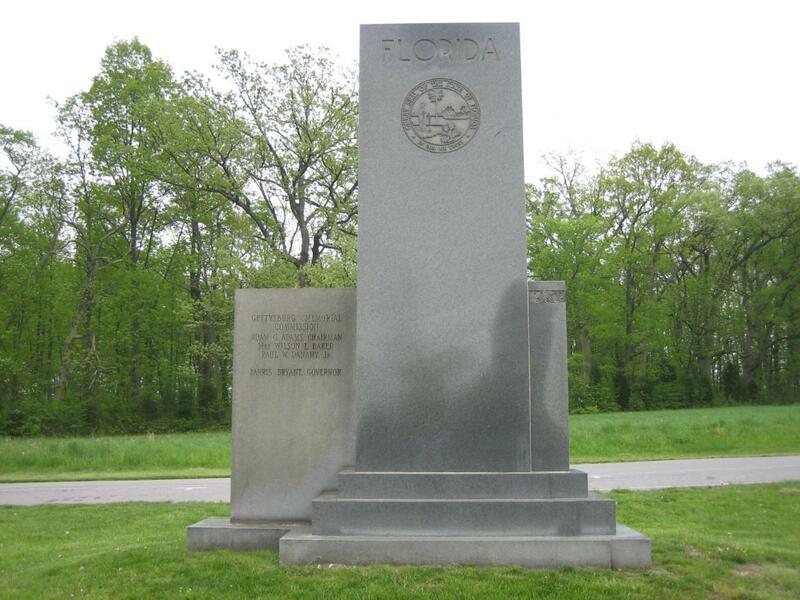 There were only three small Florida regiments at Gettysburg, represented by the three stars on the right piece of granite, or plinth. The regiiments were part of Perry’s Brigade, Anderson’s Division, A.P. Hill’s Third Corps. The monument is located on Seminary Ridge along West Confederate Avenue. This view was taken from the east facing west at approximately 4:30 PM on Thursday, May 8, 2008. In the early 1960s, around the centennial of the Civil War, some southern states decided it would be a good idea to erect monuments at Gettysburg and other Civil War battlefields. It appears that the job was rushed in order to get the monuments up during the celebration period of 1961-1965. The monuments are not notable, except for being square pieces of granite put together in the shape of a memorial. States that contributed monuments at this time included Georgia, South Carolina, Florida, Arkansas, and Texas. The rain was beginning to fall when the Gettysburg Daily visited the Florida monument on Thursday afternoon. Perry’s Florida Brigade, under the command of David Lang made two charges across the area in the background of this photograph. The woods in the background are the Alexander Spangler Woods. One attack was on July 2nd, and the other on July 3rd as part of the Pickett-Pettigrew-Trimble Assault/Longstreet’s Assault/Pickett’s Charge. The monument claims that the battle with 700 men and suffered 445 casualties, or 64%. Busey and Martin’s book on Gettysburg claims the brigade began the battle with 739 men, and suffered 343 casualties, for 46.4%. This view was taken from the west facing east at approximately 4:30 PM on Thursday, May 8, 2008. There were 18 states representing the United States at Gettysburg, plus the United States Regular army troops. The Confederacy was represented by 12 states at the battle. Therefore 31 states/regulars were present. The 739 men that Florida had at Gettysburg placed the state 28th in overall rank. Their 46.4% casualties tied them for third with North Carolina. Minnesota had the highest percentage of casualties at Gettysburg, and Tennessee was second. This view was taken from the south facing north at approximately 4:30 PM on Thursday, May 8, 2008. 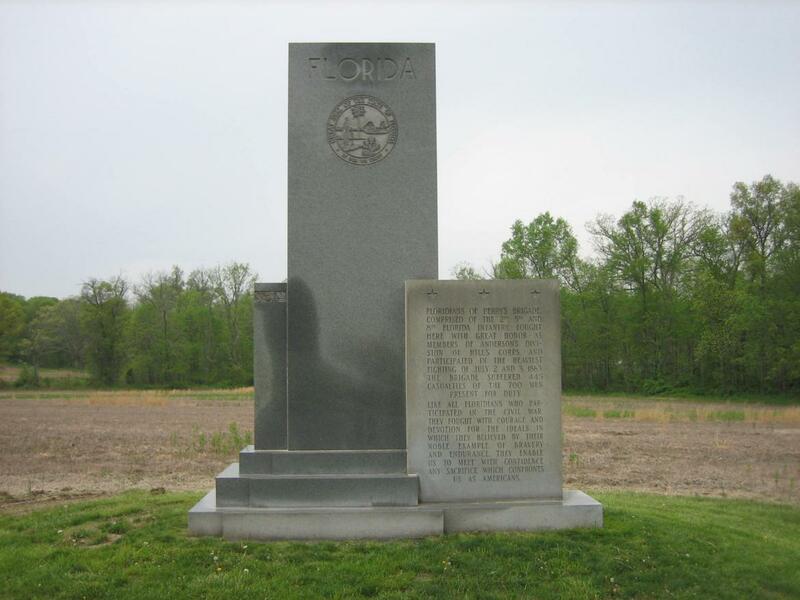 The monument was dedicated on July 3, 1963, the 100th anniversary of their attempt to assist Pickett’s Division. The cost was $20,000. It is 14′ 3″ in height. 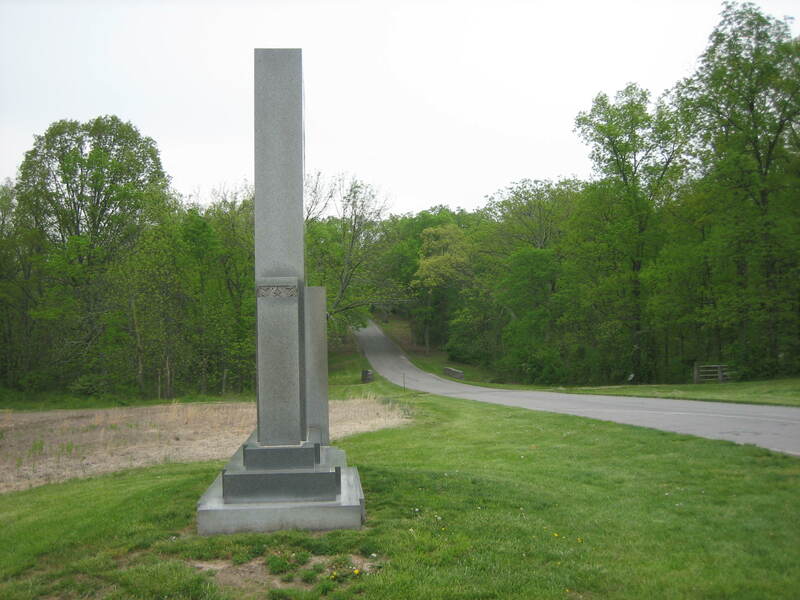 From north to south the monument measures 11’8″ at its base. 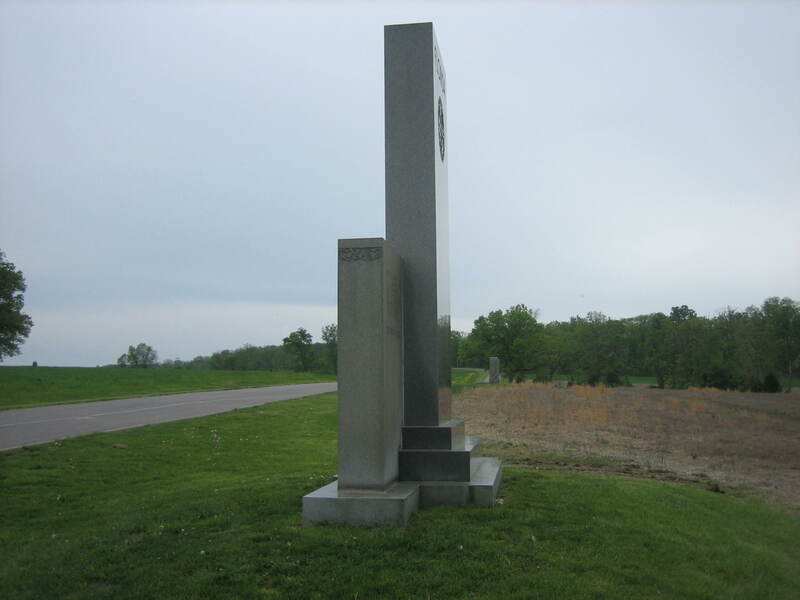 The base measures 4’6″ from east to west. Southern Granite was the material used. This view was taken from the northwest facing southeast at approximately 4:30 PM on Thursday, May 8, 2008.